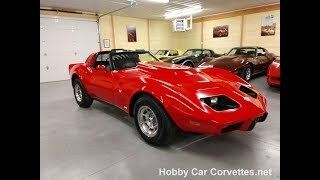 Hi, I am interested in your 1978 Chevrolet Corvette listed on Autotrader for $20,000. I'd like to get more information about this vehicle and confirm its availability. 454 Big block, four speed manual transmission, black leather interior, 85,700 miles on dash (title is exempt for mileage), power steering, power brakes, AM/FM/Cassette radio, alloy wheels, tilt and telescopic steering column, Gymkhana suspension, L88 high rise hood, Sanders headers, Flowmaster mufflers, 2 1/2″ dual exhaust, and much more.